So far I only have one significant bridge. It is a lift bridge, and is motorized with two of the red micro motors. I control it from the switches on the speed controller (visible in the overhead shot on the passenger train page which is reproduced here). This picture shows the metroliner crossing the bridge, exiting onto the tower side approach span (near side). The 8 crane weights are clearly visible. A boat (6441 sub tender) is waiting patiently for train traffic to clear so the bridge can be raised for it. It's going to have to wait a while, as we know where my priorities lie, don't we??? This shot also shows the speed controller. 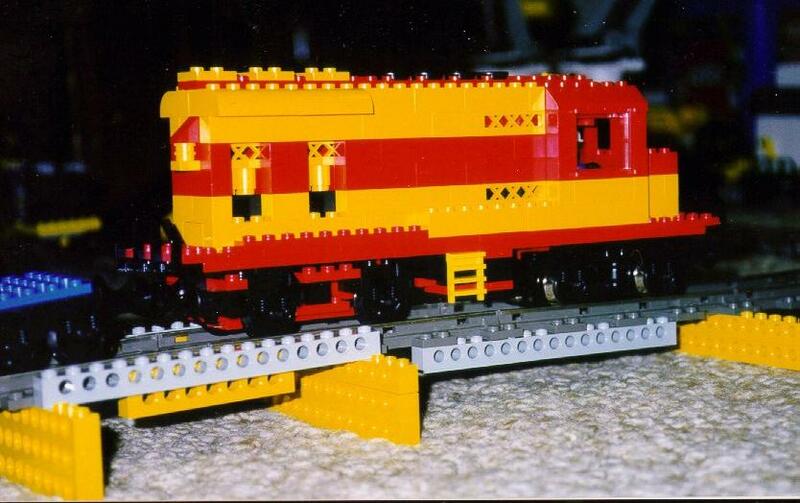 This shows the Red White Caterpillar crossing at speed. I can run flat out across the gaps with little trouble, if the maid hasn't bumped the bridge when she was vacuuming. Note the primitive slough crossing bridge in the foreground that 4wd traffic is queueing up to use, including a little lost Adventurer. This picture shows the bridge fully raised to allow boat traffic to go through. You can see the hinge point clearly. When building one of these you must remember your simple machines class and make sure that your hinge point is such that the deck can raise without the rails or other parts of the deck impinging as they go. The hinge on this one is almost exactly at rail top level, and further, is set back far enough from the edge of the deck that the rails lever up and out of the way smartly. This picture shows the underside of the deck in raised position. Note the power wire snaking up. There needs to be a power connection to the track on the bridge deck since it merely comes close to the track on the approaches (close enough for wheels to reliably cross) but does not touch that track. You can see the end of the track at the very tip of the span. 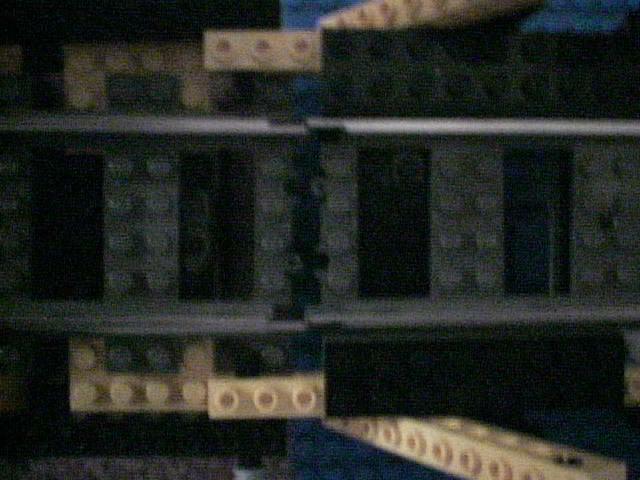 Just below it are some inverse slopes to guide the span end into alignment as the span is lowered. This picture shows the gears that bring motion up from the micro motors. They are buried under the deck, each with a worm. The worms each drive a gear on a common shaft, which ensures that the two motors stay synced. The common shaft drives gears that bring motion up the sides. There is a crossover to take motion from OUTSIDE the weight tower to inside. The final gear is an 8t which drives the rack in and out. Some of this is obscured by the weight tower. There is another 8t idler to keep the rack horizontal. All this gearing is reproduced on both sides of the tower so the two racks move in synch. 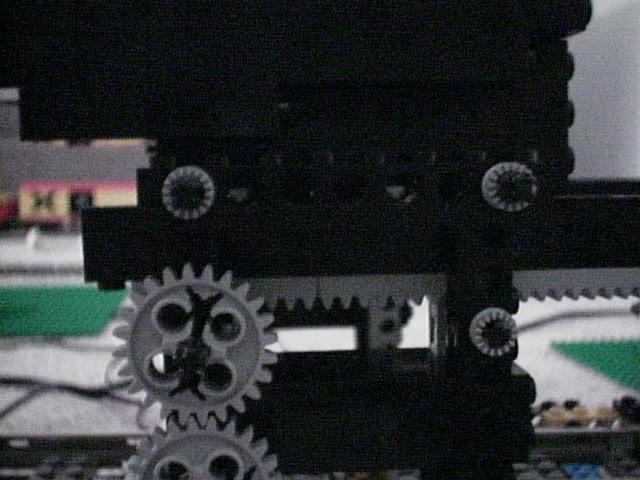 Detail view of the 8t gears that drive (and idle) the rack. 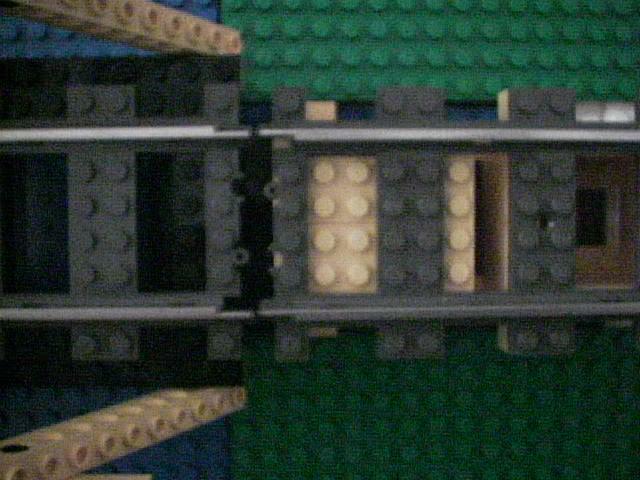 An overhead view of the far (non hinge) end of the bridge.